Download OpenComRTOS designer suite v.1.4. Master thesis proposal on a safety case. The OpenComRTOS designer suite v.1.4. (Win32) with new supporting tools and demos is now avalable from the download section. 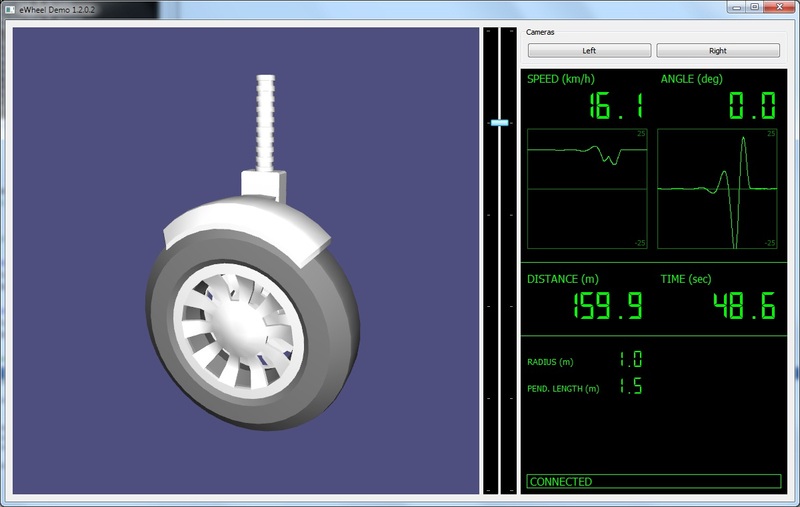 An interesting new example is the e-wheel simulator (see screenshot). It is composed of 3 nodes, one handling the input from the user, one running the control loop and one running the physical model. An additional windows application handles the 3D visualisation and user input. While the example is a simulation, it is complete and by a simple recompilation the controller node can be remapped to e.g. an attached ARM controller (of any other supported). This ewheel demo is also the subject of a Master Thesis proposal supported by Flanders Drive. Interested students can contact us or Flanders Drive. For details see the attached thesis outline. Altreonic NV, the Belgium based embedded software solutions provider is pleased to announce the bundling of its formally developed and network centric OpenComRTOS with supporting tools in an integrated tool suite. The suite comprises OpenComRTOS 1.3, OpenVE and OpenTracer. Altreonic has released version 1.2 of its OpenVE with OpenComRTOS, its formally developed network-centric RTOS. This version features an improved link driver model, a much improved build system generating the code for heterogeneous target systems besides other small improvements. The hostserver was also upgraded with more functions to support access to host nodes for e.g. console access and graphics. The OpenTracer was redeveloped as well and now makes it easier to visualise large networks of nodes, including the details of the inter-node interactions. Altreonic has announced the release of OpenComRTOS with support for transparent real-time programming of heterogeneous target systems, including multi-core CPUs. The product will be demonstrated at Embedded World in Nuernberg next week. Nominated for the Embedded Award at Embedded World, OpenComRTOS is the result of a four year effort to develop a network-centric RTOS (Real-Time Operating System).